If President Trump and Kim Jong Un come closer to an agreement, Chinese stocks are particularly poised to benefit, according to CNBC analysis using Kensho, a quantitative analytics tool used by hedge funds. When worries about North Korea's nuclear threat escalate, European and emerging market stocks are among the worst performers, according to Kensho. A successful outcome of U.S. talks with North Korea could give a boost to Chinese stocks and a U.S. exchange-traded fund that tracks them, according to a study looking at financial market reactions to past milestones regarding the rogue nation. A disappointing outcome could hurt European stocks, the study showed. President Donald Trump is set to hold a historic meeting with North Korean leader Kim Jong Un in Singapore beginning Monday evening EDT. It's uncertain whether the leaders can agree on issues such as immediate denuclearization and sanctions relief. The meeting itself was temporarily canceled by Trump. But if the two leaders come closer to a resolution, Chinese stocks are particularly poised to benefit, according to CNBC analysis using Kensho, a quantitative analytics tool used by hedge funds. The iShares China large-cap ETF (FXI) climbed an average 0.9 percent in the two trading days after talks between leaders of North and South Korea that indicated improved relations. The study looked at 19 instances since Kim assumed power in late 2011. FXI tracks companies such as Tencent, Bank of China, PetroChina and Air China, a state carrier that said earlier this month it is resuming flights between Beijing and Pyongyang. The majority of North Korea's trade is with China, which supplies most of the rogue state's oil. Other global markets tend to gain after talks between South and North Korea. The iShares MSCI South Korea Index Fund ETF (EWY), iShares S&P Europe 350 Index ETF (IEV) and iShares MSCI Emerging Markets Index ETF (EEM) all climbed about half a percent on average, the Kensho study showed. In the U.S., the S&P 500 rose an average 0.2 percent, according to Kensho. The Cboe Volatility Index (VIX), a measure of fear, drops 3 percent on average. 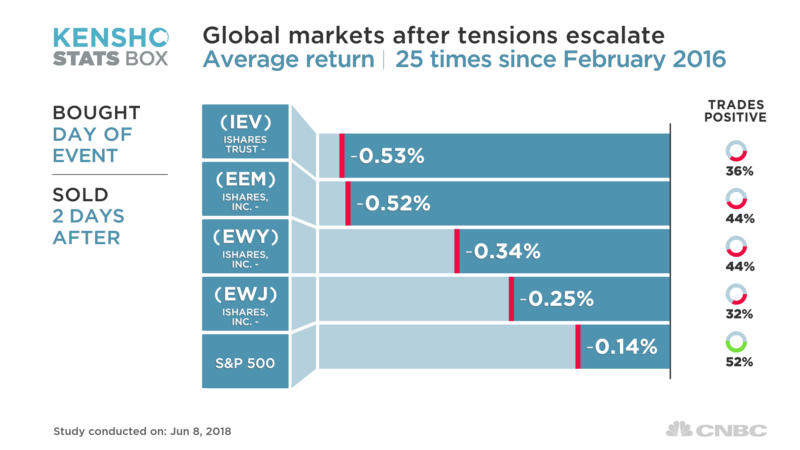 IEV and EEM each fall half a percent on average in the two days following a successful missile test or a particularly aggressive statement from the Trump administration, according to Kensho. The study looked at 25 such occasions since Kim took power. 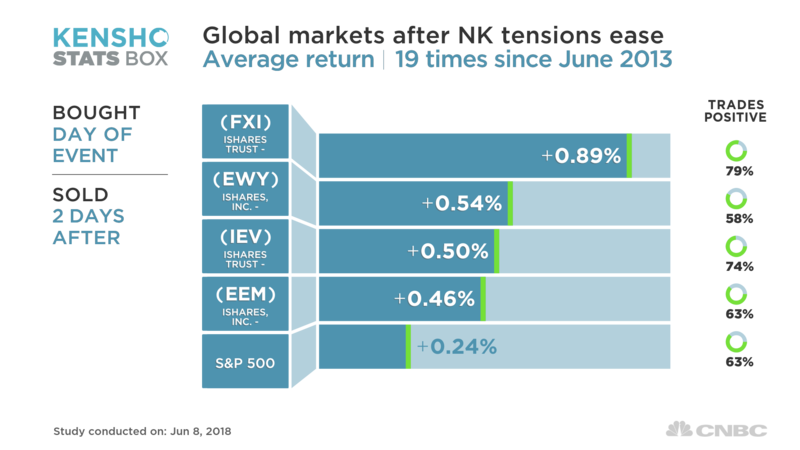 South Korean stocks tended to fall about a third of a percent, while the iShares MSCI Japan ETF (EWJ) declined a quarter of a percent, on average, when tensions around North Korea increase, the Kensho analysis found. The VIX jumps 5.6 percent on average. The S&P 500 and China's FXI trade positive roughly 50 percent of the time, no better than a coin flip.